Provide comfort for the family of Marjorie Zamoic with a meaningful gesture of sympathy. Marjorie L. Zamoic, 96, wife of the late Samuel Zamoic, died March 21, 2019 after a brief illness. Born in Lyndonville, Vt, the daughter of the late Herbert and Grace (Hill) Stahler, she was a graduate of Lyndon Institute. In the early 1940’s, she came to Connecticut to work at Chandler Evans and then International Silver. She met and married Marine Sergeant Samuel Zamoic in 1949. When her children were older, she went to work for the Seven Up Bottling Company in Meriden for many years. Marjorie loved her family, her cats, reading, and soap operas. 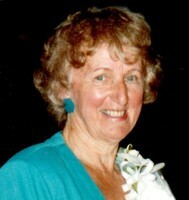 She was a dedicated patron of the Meriden Public Library and visited there only two weeks ago. There were very few times in her life when she did not have a cat, and they were all lucky to have her as a pet mother. Marjorie also enjoyed traveling and was thrilled that she was able to take four trips to Europe, visiting France, Switzerland, Germany, and England. She is survived by her daughter, Linda Hayes of Southington; her son and daughter-in-law, Michael and Rhonda Zamoic of Meriden, and many nieces and nephews in Connecticut and Vermont. She was predeceased by her sister, Beverly Reagan-Platt, and her brothers, Howard, Russell, and Francis Stahler. Family and friends are invited to attend a funeral service to be held on Tuesday, March 26, 2019 at 11:00 a.m. at the John J. Ferry & Sons Funeral Home, 88 East Main Street, Meriden. Burial will be at the convenience of the family. Family and friends may call at the funeral home on Monday, March 25th from 4 to 7 p.m. In lieu of flowers, contributions in her memory may be made to the Meriden Humane Society, 311 Murdock Avenue, Meriden, CT 06450, The Connecticut Humane Society, 701 Russell Rd, Newington, CT 06111 or to the Meriden Public Library, 105 Miller St, Meriden, CT 06450. Mrs. Zamoic’s family would like to thank the staff at Midstate Medical Center for their care of Marjorie in the last week. For online condolences, please visit jferryfh.com. To plant a memorial tree in honor of Marjorie L. Zamoic (Stahler), please visit our Heartfelt Sympathies Store.